Nooch is the name given to nutritional yeast, which is found in a number of health food stores these days in large quantities. It is considered to be a magical product. Actually, nutritional yeast is a type of microorganism which grows on beet molasses and sugar cane. After harvest, this microorganism is heat treated for deactivation, then it is flaked or crumbled. Although it does not seem to have an appealing appearance or name, but there are many nutritional yeast benefits and it is probably one of the best foods to include in your diet. Nooch is rich in minerals, vitamins and proteins and has a cheesy, nutty flavor which makes it uniquely suitable for vegans as well as paleo lovers. The following are among the reasons that make this substance a magical ingredient for cooking. In order to grow the yeast, B-vitamins are added to it while the nutritional yeast is being processed. This is why nooch contains a high amount of B vitamins. These vitamins are needed by the body for maintaining a robust nervous system, regeneration of red blood cells and keeping a steady food metabolism. Since vegan diet does not have B vitamins, they usually miss out on these essential nutrients. But a single tsp of nutritional yeast contains a day’s worth of B-12. So nutritional yeast is a very popular addition used in vegan recipes. However, be sure to check the label as not all variants of nooch contain B12. 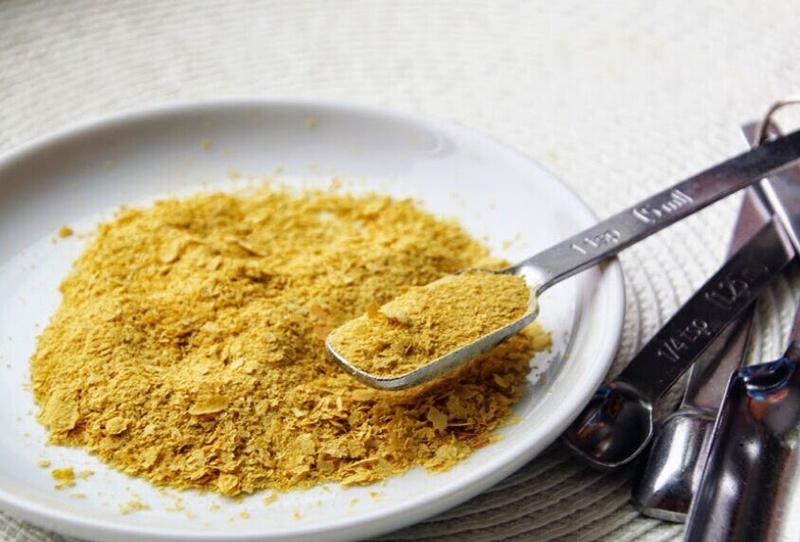 One of nutritional yeast benefits is that only 2 tbsp can provide up to 3 grams of fiber. If you want to keep your digestive system functioning properly and maintain your gut health, then you will need a good supply of fiber in your diet. Moreover, fiber is also critical for regulating blood sugar levels and is responsible for providing our body a regular source of energy all throughout the day. 2 tbsp of nooch can also give you 9 grams of protein. Even a large egg or a cup of whole milk cannot provide this much protein to you. It is thus an amazing energy source for people who work out in the mornings. Nutritional yeast contains nine of the essential amino acids out of the total 18 that are not produced by the body itself. It is for this reason dubbed as the complete protein. Compounds that have been known to help in cancer prevention, provide better immunity and bring about a reduction in cholesterol levels like glutathione, mannan, beta-1,3 glucan and trehalose are also present in nutritional yeast. Another benefit of nutritional yeast is that it offers ample amounts of mineral like zinc, iron and selenium as well. Nutritional yeast also contains folic acid which is particularly necessary for pregnant women or who are trying to conceive. Moreover, folic acid can help in the prevention of major birth defects like spina bifida as well. Another of the nutritional yeast facts is that it contains little fat and sodium. This is extremely beneficial for your health. It also does not contain soy and dairy either. Moreover, nutritional yeast also lacks Candida albicans, which is a yeast type that aids the worsening of candidiasis, a type of fungal infection. One of the best nutritional yeast benefits is that it is completely devoid of gluten. This is good news not only for all the vegans but is also a treat for patients suffering from celiac disease. If you have trouble digesting gluten, then nutritional yeast is the product for you. Vegans in particular love the savory flavor of nooch as it is very similar to that of cheese. A search on the internet for recipes of vegan mac-and-cheese will show you that nutritional yeast is more often than not the main ingredient in them. However, vegans are not the only ones that can benefit for it. Any person can add nutritional yeast in their diet to make it delicious and healthy. Add it in small amounts to the cooking water for polenta or "cheesy grits"
Blend raw almonds with nutritional yeast in a food processor to make almond "parmesan"
Baker’s yeast and nutritional yeast must not be mixed with each other. Baker’s yeast is active and can grow inside the stomach. Nooch is also different from brewer’s yeast as well which is bitter in taste even though it is inactive too. If stored in a dry and cool place, nutritional yeast can be used for up to a year from the day it is sealed. In frozen state, it remains usable for around two years if it is sealed in bags. It can be found in the bulk section of natural foods stores. Server responsed at: 04/22/2019 4:14 a.m.